Banners are generally used for social media promotions like Facebook, Google Plus, Twitter and more. It is time-consuming when you need to design a header or promotional banner by yourself, but you can save much time by simply free downloading and use these easy banner design software. Edraw Banner Design Software Windows is a simple but effective tool for designing creative banners from its delicate banner templates for social media like Facebook, Twitter, Google Plus, and ads, website. Flyers have become the most commonly-used tool for business promotions. They’re effective, easy to distribute and create lasting impressions. Here we’ve just Listed top 4 awesome flyer design software for Windows. Edraw flyer software is a drag-and-drop tool for Windows, it offers various titles, text blocks and other symbols needed for uses. It also provides abundant templates and examples for users to start drawing quickly. And it keeps updating new flyer symbols and templates. More than 10000 editable vector flyer symbols are provided and grouped into different categories. Ever-increasing professionally designed flyer templates & examples are available for users to get a quick drawing start. You are able to insert the pictures and trim them to any shapes they like with the cropping toolkit. Real-time collaboration and multiple file formats export enable users to collaborate and share with others conveniently. Fully compatible with Windows, Mac, Linux. It currently does not support creating flyers on the mobile phone. MS Visio is expensive for you, looking for a Visio alternative at a lower cost. Edraw Should be what you need. We will walk you through the best Visio alternative for P&ID. P&ID, short for piping and instrumentation diagram, is a process documentation representing the technical realization of a process by means of graphical symbols, such as the service lines, instruments and controls, valves, and equipment. 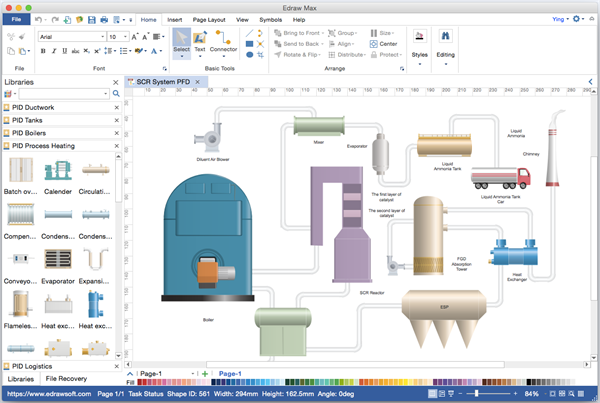 Edraw P&ID Visio Alternative is the best choice to create piping and instrumentation diagram on Mac, Windows, and Linux. It has a very responsive and easy-to-use interface resembling well with Visio. Import to Visio and SVG files are acceptable.